You are invited to attend the opening of the new Art Exhibit featuring two creative duos husband and wife Ukrainian artists, Olga & Ivan Karakul and Tetiana & Mykhaylo Vytiahlovskyi. All 4 artist are classically trained and accomplished artists from Ukraine. The exhibit will feature their vibrant, Ukrainian inspired art work. A beautiful and colorful collaborative of oil paintings many featuring seascapes and landscapes of the Crimea region where Ivan and Olga Karakul are from. Olga will have many beautifully painted silk scarfs. 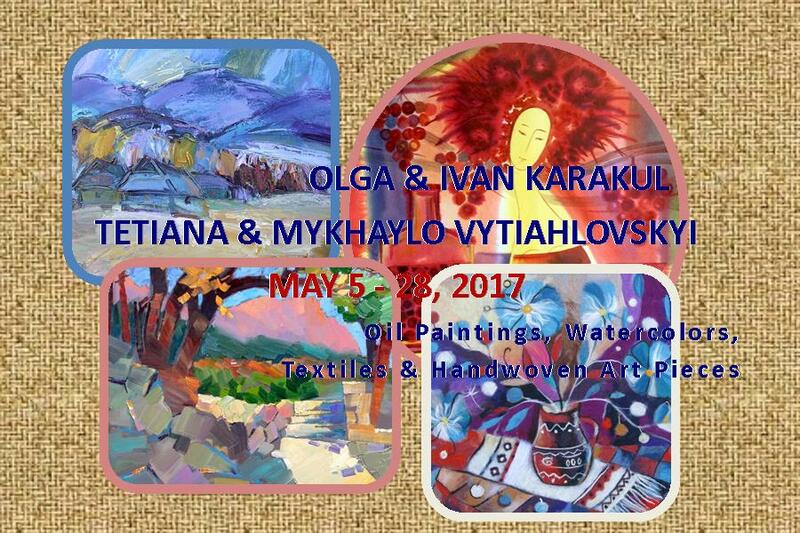 Additionally the exhibit will feature Tetiana’s wool paintings and wonderful textiles and her husband’s Mykhaylo’s oil landscapes. All paintings and art pieces are for sale. The exhibit opens Friday, May 5th at 7:00 pm Admission: Adults, $10.00 children under 12-Free. The exhibit will continue through May 28, 2017.